Since I started wine pondering, I wrote quite a few articles about wine bottle sizes and shapes. I just recently received various requests for more specific measurements. So I tooled myself with a tape measurer and a caliper, and I started measuring wine bottles from my own collection. 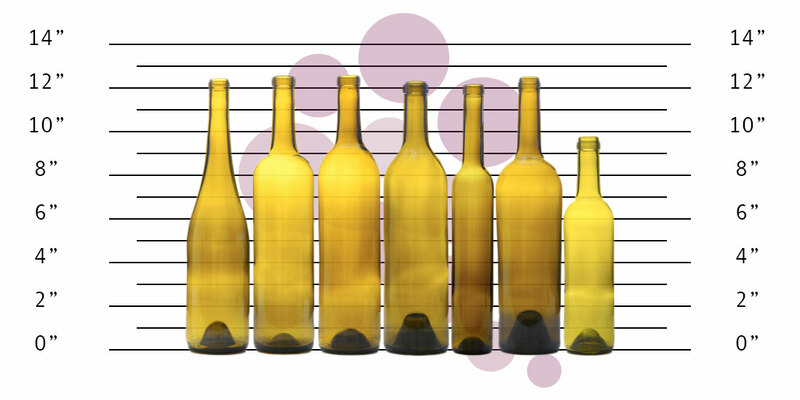 Everything you want to know about wine bottle sizes and more! Bottles sizes vary based on wine types, locations, and glass manufacturers. There might some kind of standard in the wine industry, but it always comes down the winemaker’s preference. I really enjoy variety but it does make wine storage a bit of a challenge. If you only have 10 to 15 bottles, then it doesn’t really matter. But when you start collecting wine bottles by the hundreds, real estate is key! So let’s get ourselves some wine bottle measurements! 1. The thickness of the glass. A heavyweight bottle is much larger than most. It’s essentially the thickness of the glass that makes it bigger. The interior is the same as a traditional bottle. Naturally, the thicker the glass, the heavier the bottle. Weights can vary from 500g (17.5 ounces) for a lightweight bottle to 950g (33.5 ounces) for a heavyweight bottle. It’s almost twice the weight! The above measurements are some crucial information you will need before buying a wine cooler. Watch out for those heavyweight bottles and make sure the wine cooler you get has enough vertical space between the shelves!! Someone left a comment on another article asking about specific wine bottle sizes. It doesn’t seem like much of an issue but some wine coolers do not allow enough vertical space between the shelves for those heavyweight bottles. I own two wine refrigerators. One has shelves that are 3.5 inches apart and it is a little too tight for some bottles, especially for those Syrah and Pinot bottles with a thicker glass. Conversely, the other wine refrigerator is just fine with shelves that are 4 inches apart.